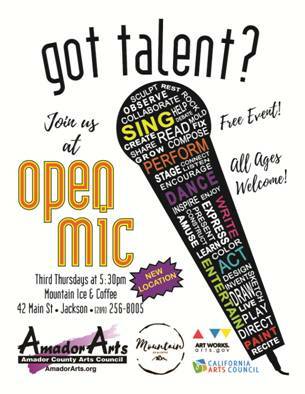 The new home for the Third Thursday Open Mic Night is in the recently-opened Mountain Ice & Coffee at 42 Main St., Jackson. From 5:30 to 7:30 pm on Thursday, April 19, AmadorArts is excited to present this new venue that will be serving up some fine culinary arts such as Temple Coffee and Kneading Dough locally baked goods. Besides featuring the talented family-friendly performers of all ages who show up, this April 19 event will have a screening of the two short winning films created for the Student Voices Campaign by students of Amador and Argonaut High Schools. The evening will also feature super-entertaining scenes performed by drama students from both high schools as they prepare for the Mother Lode Drama Festival coming up that weekend. Invited to this free event are individuals who feel they’re ready for an audience to perform dance, singing, musical theatre, Shakespeare, poetry, oratory, instrumental music, stand-up, and improv. Equally important are people IN the audience who appreciate seeing who have entertainment gifts to share. One of the newer traditions at Open Mic will continue: Group Art Analysis in which a local guest visual artist brings an artwork to Open Mic and an AmadorArts Student Director leads the group in a detailed analysis of the piece. It’s a fun thing, and the group element has proven to unite the crowd and make friends out of strangers. Mountain Ice & Coffee provides a relaxing atmosphere with comfy couches for lounging as you enjoy Open Mic. Sign-ups are first-come-first-served, starting at 5:30 pm. Mountain Ice & Coffee phone number is 209-256-8005. Regular hours are: Wednesday thru Sunday from 7am to 7pm. AmadorArts is 209-267-9038, email amdorarts@gmail.com.